This is just an introduction to the Cottrell family connection. We've already introduced Charles Early, in the "Early" family line section. (See "Early" family line). 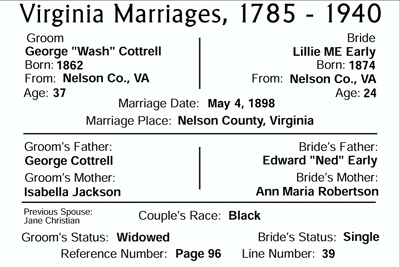 From here we must look to his sister Lillie, for the connection to the "Cottrell" family. Lillie Early, born 1874, married Wash Cottrell, born 1862. 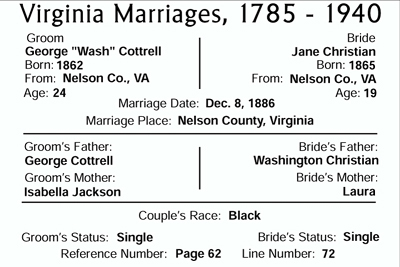 Wash and Lillie only had 1 child named Early Washington Cottrell. Wash had a previous spouse named Jane Christian, born 1866. This is where the "Christian" family connects. 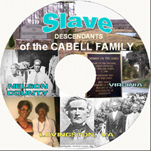 Wash, was the 4th child of seven, through his father George Sr.'s second wife, Isabella Jackson. George Cottrell, Sr. also had a previous wife named Sarah. George Sr., and Sarah's son, George Andrew Cottrell, born 1862, married Sarah Ella Johnson. George Andrew's daughter, Fannie Cottrell, married Eugene Bailey (son of Johnathan Bailey, and Pauline. (See "Bailey" family line). George Andrew's son John James Cottrell, born 1890, married Hattie Forest, born 1891. Hattie, was the daughter of Eliza Nicholas (daughter of Old John Nicholas). 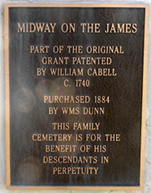 (See "Old John Nicholas" family line). 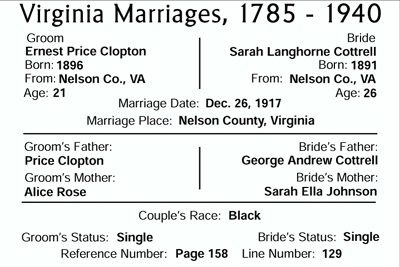 George Andrew's daughter Sarah Elizabeth Langhorne Cottrell, married Ernest Price Clopton. Ernest, was the son of Price Clopton, and Alice Allen Rose. Alice, (See "Rose" family line). (daughter of Isaac Rose, and Cornelia), was the second wife of my great grand father, Alex Allen (See "Allen" family line).